Week 23 – How a small moment became a big experience. Join me in London! I’m here for the week and excited to teach a new and different all-day workshop this Saturday, June 7th, called “Self Care Boot Camp.” During the program, I’ll be coaching audience members through the self-care challenges we can all relate to. My goal is to create on-the-spot transformations while demonstrating advanced coaching skills. It should be interesting . You can register here. It’s 6am here in London and I’ve been up for the last hour watching the sunrise over the city from my hotel room. I’m heading out to teach a workshop in a couple of hours and I’m excited despite only two hours of sleep. It’s funny how we find the energy and enthusiasm to do what we love, isn’t it? As I sit here in the sunlight thinking about what to write, I stare out the window at the London Eye, the giant Ferris wheel that sits on the South Bank of the River Thames. What a sight! That’s when I have a moment. A veil lifts and I feel a kind of blissful Oneness with all that exists in the Universe. A feeling of warmth and comfort washes over me. Life is good and full and right. I’m grateful for Michael snoring in the next room, a familiar sound that makes me smile. I’m grateful for my laptop and the way I can communicate so effortlessly with the world. I’m grateful for my fingers that type words onto the page, allowing me the creative expression my soul desires. I’m grateful for the good friends I have here, soul friends, and the way we’re able to get to what’s deep and meaningful and real in a matter of minutes. I’m grateful for the boxes of Kleenex in my room that are aiding my recovery from a head cold I picked up before I left home. I’m even grateful for the head cold because I know on some level it’s helping me clear out old energy. 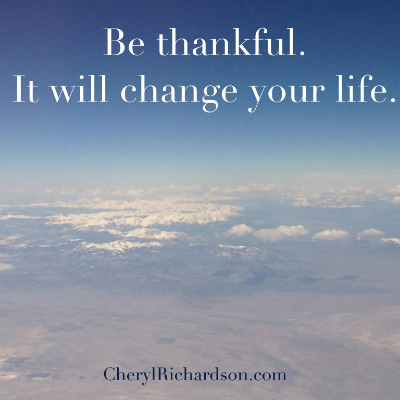 We’ve all heard it a bazillion times, that a practice of gratitude can heal and transform. But it’s so easy to forget how powerful it is until we stumble upon these moments. So today, find a little light, get still, and connect. The blissful Oneness is waiting for you, too. What an inspiration the man is in this week’s video. He inspires gratitude. Thanks, Danny (and Oprah) for sharing his story! You can watch it here. Life Makeover For The Year 2014 (sm) is written and produced by Cheryl Richardson. If you have any questions or comments, or for reprint permission of this newsletter, please email:cheryl@cherylrichardson.com. © Copyright 1999-2014. Cheryl Richardson, P.O. Box 13, Newburyport, MA 01950. All rights reserved.